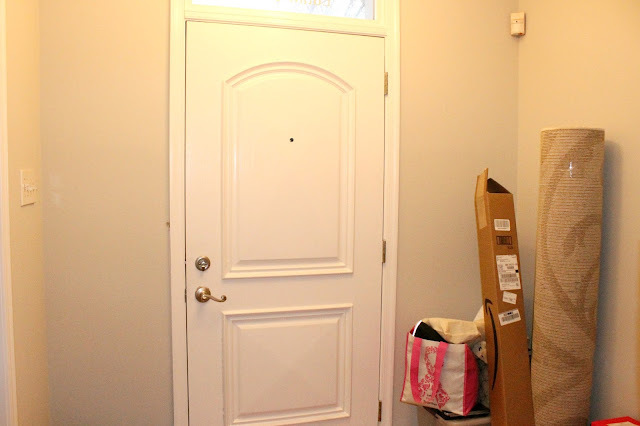 Every year since I started blogging, I've had the idea to post a tour of my apartment. I've never actually gotten around to it because I never managed to "stage" my place to get it photo-ready. 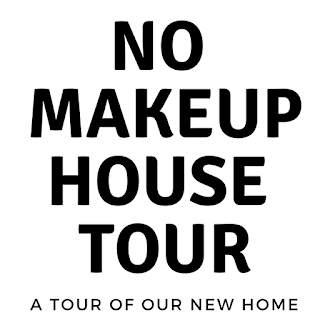 Recently, I came across the idea of a "no makeup" house tour - a photo shoot of the house as is, not staged, not styled, just lived in. Now, 98% if those posts I've seen have absolutely been staged in some way. Come on, I know that you don't have a tray of fresh flowers just sitting on your bed with two magazines placed just so on any given Tuesday. Today, I'm giving you the real deal no makeup house tour...with unpacked boxes, messy corners, and laundry that hasn't been put away. 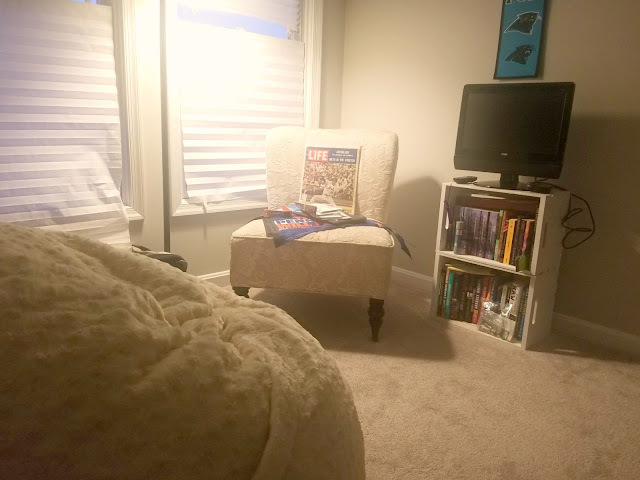 While I like to think our house will usually look a little bit better than this, I'm excited about our new home and wanted to share it, so here's the tour! The First Floor - This is the least exciting floor of the house. It really only has the laundry room and office, and not much else. Since we've moved in, we've managed to raise the temperature of the 1st floor from 42 degrees to 53 degrees, so we haven't done much there because it's way too cold to do anything! We did have to replace the washer/dryer right after we moved in (there was black mold inside the washing machine!) which resulted in us having to replace the floor. As you can see, I've managed to do some spackling on the walls but haven't gotten around to touching them up with paint. I have big plans for this room! My Office: I can't wait to finish this space! Working from home 3-4 days every week means I really need a comfortable working space. 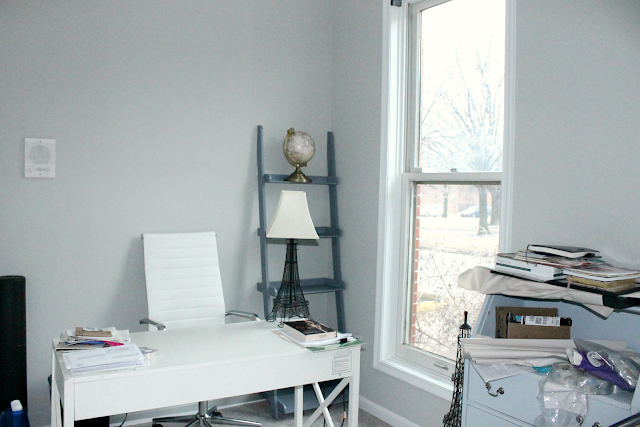 I have so many fun ideas for my office and we're getting started on it this weekend! For now, though, it's just a mess. The Second Floor - The second floor is the main living area. This is where the kitchen and dining room, half bathroom, and living room are. I love that this space is separated from the bedrooms upstairs, and from the office downstairs! It definitely creates a nice flow through the house for when we entertain or when I'm working and The Pilot is home! The Kitchen: This is one of the first areas of the house that I want to renovate. It will likely have to wait until fall but I do love how open it is and how much counter/cabinet space we have! I love to cook so I really want to love my kitchen! The Half-Bathroom: I can't wait to redo our bathrooms. We're going to start with this one next month. When we moved in, it didn't even have a mirror! We pulled one from one of the upstairs bathrooms to put in this bathroom but we're still one mirror short! The Living Room: So far, the living room is the most finished room in the house but it still needs some work! I really love how it's coming along though! The Deck: Is it spring yet? I have grand visions of spending hours on the deck laying on a chaise, reading books, soaking up the sun, and tending to my not-yet-existent herb garden (and painting that unpainted plank). The Third Floor - This is where all of our bedrooms are. I love that the bedrooms are separated from the rest of the house, it makes going to sleep so much more relaxing! There are three bedrooms upstairs. I'm using the future guest room as my own little yoga studio for now! The second upstairs bedroom is The Pilot's "Moffice" (Man Cave + Office). The Guest Bath: This is where we took the mirror in the downstairs bathroom from, so this bathroom needs a mirror. I also want to get rid of the medicine cabinet. The Master Bedroom: Our bedroom is a good size but it's long and narrow, which makes it a little bit challenging to decorate. So far, this is what we've done but I don't love it yet. I've been brainstorming ways to maximize the space and really make it feel nice and relaxing! The Master Bath: In a terrible design flaw, the Master Bathroom is the smallest bathroom in the house. I don't think there's anything we can do about that but I do want to make the room look nicer and more relaxing (starting with that towel rack coming down!). As you can see, we definitely still have some work to do (namely, putting things on the walls!) but I really wanted to share what our place looks like! Later this week, I'll be sharing a list of projects that we want to tackle this year and some design challenges I'm struggling with, that I would love to crowdsource ideas for!